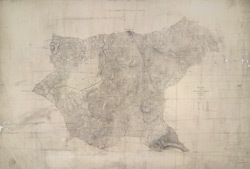 This plan shows northern Shropshire and its border with Cheshire and Flintshire. The Ellesmere Canal is marked in blue. The draughtsman has recorded the individual locks, most notably on the section leading towards Whitchurch. An area calculation table survives in black ink in the right margin.